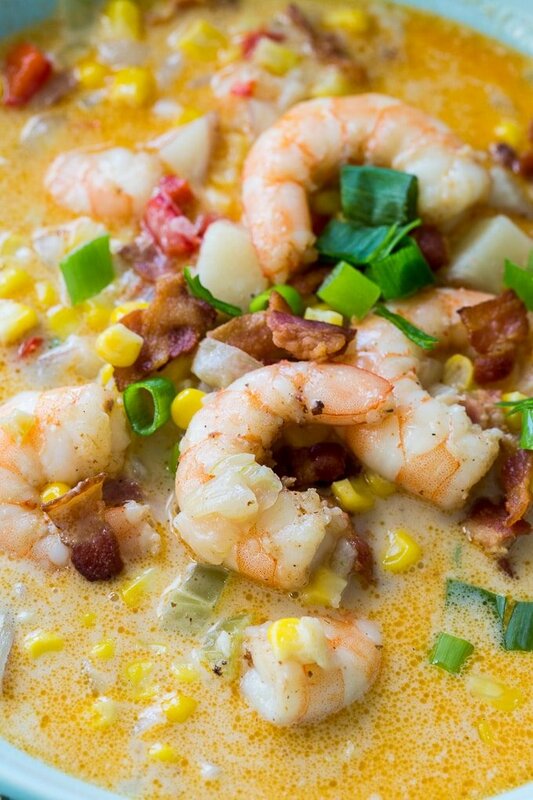 Cajun Shrimp and Corn Chowder is a hearty soup for cold weather with chunks of potato and salty pieces of bacon. Serve with a crusty piece of bread for a comforting cold weather meal. The weather in South Carolina has been absolutely frigid the last few days and I know it is even colder in many areas of the country. Defintely soup weather!! 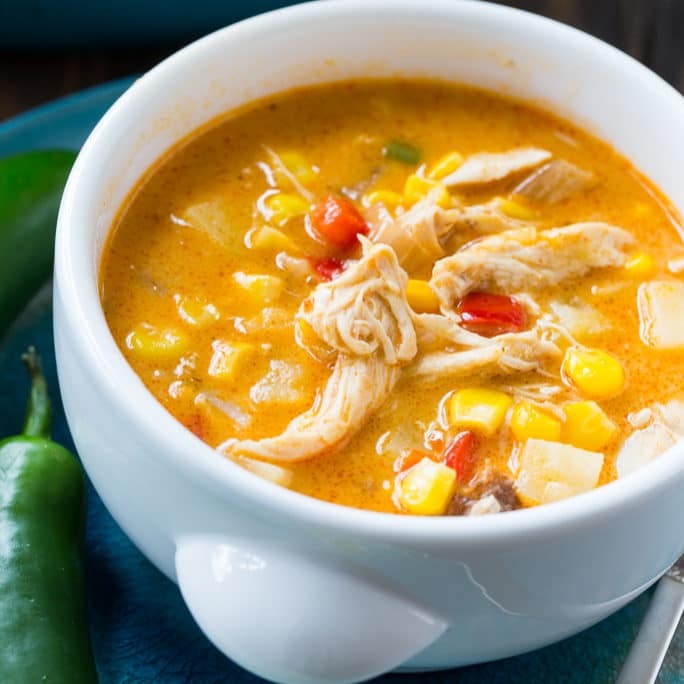 When it comes to soups I favor thick, hearty, and creamy chowder-type soups and shrimp and corn is probably my favorite combination. 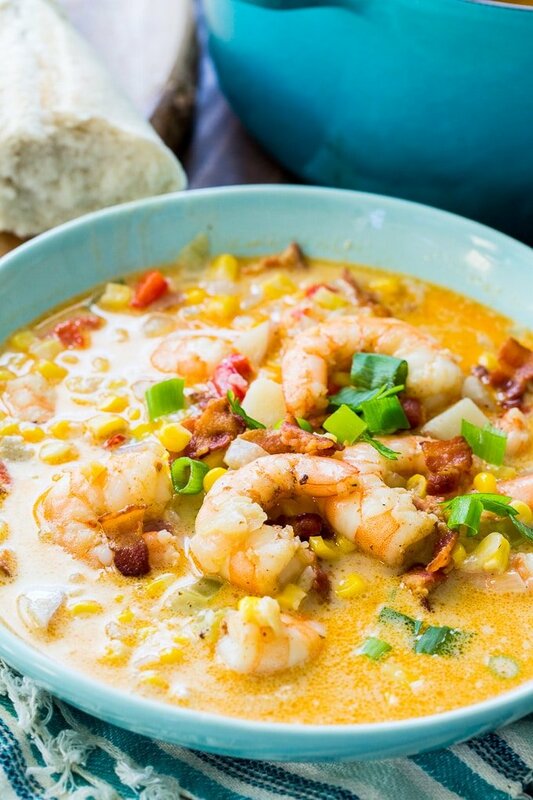 This Cajun Shrimp and Corn Chowder is also spicy so it will really warm you up! This chowder is perfectly seasoned with Cajun seasoning, garlic, and thyme . There’s also some sweet onion, green onion, red bell pepper, and celery. And of course corn is one of the best complements for shrimp. In the winter, when corn is out of season, use frozen corn. But fresh corn is even more delicious if it is available. The corn gives just a touch of sweetness to contrast the spiciness of the cajun seasoning and the saltiness of the bacon. Cook bacon in a large Dutch oven until crisp. Remove with a slotted spoon and set aside, leaving bacon grease in the Dutch oven. Add shrimp and 1 teaspoon Cajun seasoning and cook until shrimp just turn pink, about 2 to 3 minutes. (they can be a little undercooked at this point. The heat from the chowder will continue to cook them when you add them back in.) Remove shrimp with a slotted spoon and set aside with bacon. Add onion, red bell pepper, and celery to Dutch oven and cook 5 minutes, stirrinng occasionally. Sprinkle flour over veggies and cook and stir for 1 minute. Add remaining Cajun seasoning, thyme, black pepper, cubed potatoes, and corn. Bring to a boil and then reduce heat to a simmer. Simmer for 15 minutes or until potatoes are soft. Stir in heavy cream and simmer for 2 to 3 minutes. Stir in shrimp and bacon. Serve in bowls and garnish with green onion. 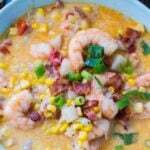 This entry was posted in Soups and Stews and tagged corn, seafood, shrimp. Bookmark the permalink. 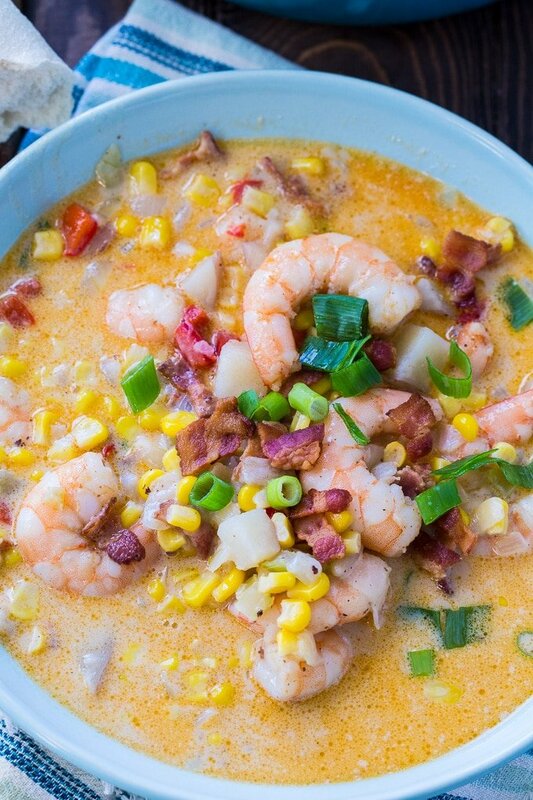 Absolutely love the shrimp and corn chowder! Never any leftover. My 28 yr old picky eater son says this recipe is heaven and shares it with his friends. Thank you so much for making me look like a top shelf chef.